WASHINGTON (TICKER) -- There may be a new face on the American tennis scene. John Isner continued to surprise at the at the Legg Mason Tennis Classic on Friday, advancing to the semifinals with a 6-4, 6-7 (6-8), 7-6 (7-5) upset victory over second seed Tommy Haas. The 22-year-old American, appearing in just his second tour event, used a powerful serve to blast 30 aces past Haas, the world No. 12. "This is unbelievable," said Isner, who is ranked 416th in the world. "Haas is a great player, I was fortunate to get through this match. I am as confident as ever going into my next match. I am serving well, my serve is going to keep me in every match. But I will have to be on my 'A' game (in the semifinals)." Isner's odds of reaching the finals increased somewhat when No.9 Gael Monfils of France upset No. 3 Marat Safin in the top of the draw Friday. As opposed to the world's No.22, Isner will make his semifinal debut against Monfils, who ranks 54th. Monfils, 20, won his only singles title two years ago in Sopot, Poland. After leading the University of Georgia to the National Championship in the spring, Isner had not won a match on the Tour prior to this tournament. The 6-9, 200-pounder has used resiliency to advance here, winning each of his three matches in a third-set tie break. There were no surprises in Friday's feature match as top-seeded Andy Roddick moved into the semifinals with a 7-6 (8-6), 6-2 win over No. 5 Hyung-Taik Lee, who fell to 1-10 against the American. 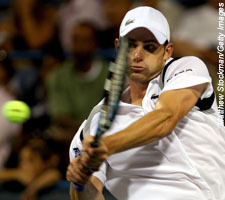 Roddick, who blasted 16 aces compared to Lee's four, also defeated the Korean in the quarterfinals last week at Indianapolis. The 24-year-old advances to play seventh-seeded Croatian Ivo Karlovic, who escaped with a 4-6, 6-3, 7-6 (7-5) triumph against unseeded Paul Capdeville of Chile earlier in the day. A winner here in 2001 and 2005, Roddick is 2-1 in his career against Karlovic, a two-time champion this season (Houston and Nottingham). Seeking his 23rd career singles title and his second this season, Roddick is trying to get his summer hardcourt season on track after last week's disappointing semifinal loss to unseeded Canadian Frank Dancevic at Indianapolis.